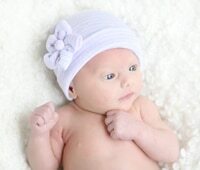 Michelle from Tweetlebug Boutique sent me The Maeve hat for a girl which features a 5 petal violet. Its blue and pink stripped and the flower is glued on to let people know that you had a girl. ($14.99) And for a boy she sent me The Davis. ($11.99) The Davis has a baby blue circle that you can personalize with your baby boys first initial or their name or last name if you don’t know what you are having. These make wonderful gifts for the new baby in your life. They have 6 patterns to choose from and also carry hair bows for that special little girl. I gave the boy one to my friend who just had a baby boy and I was a bit concerned, as her baby was 9lbs 11 oz, that it wouldn’t fit but they are very stretchy and it fit him perfect. He looked quite handsome it in. This would make a great shower gift as well.